A fine blend of Sumatra (low acid) and Italian classic, roasted to perfection to bring a strong smooth cup, with a fine delicate acidity. 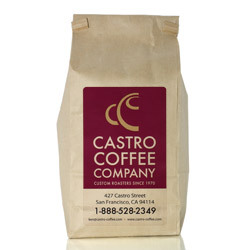 I have loved the Castro Coffee Company (or the Castro Cheesery as I have always called it). Even though I live in Oregon, I never miss it when I am in San Francisco and have often ordered on line. My favorite was always French roast and and the dark Africans. Then my partner and I went to the Castro and she saw the Sweet Italian. Q told me she had tried some from near Santa Cruz and it was great. We bought a pound. That afternoon I just had to try it. What perfection!!! We couldn't get enough and savored every drop. We are THOROUGHLY ADDICTED. And they ship it, with it arriving in a couple of days (we live in the mountains in Oregon and mail tends to be slow up here). I can't wait to place my next order this Wednesday!